Former New York Times correspondent John Herbers (1923-2017) covered the civil rights movement for more than a decade, witnessing a succession of landmark events that rocked the nation, the world, and his own conscience. Among the many stories Herbers covered were the 1955 murder of Emmett Till; the bombing of the church in Birmingham, Ala., that killed four little girls; the Freedom Summer murders in Philadelphia, Miss. ; and marches and riots in St. Augustine and Selma, Ala. Herbers was the author of four books, including two on civil rights. In his memoir, Deep South Dispatch, written with his daughter, Anne Farris Rosen, he recounted with immediacy and detail the struggle of African Americans for civil rights, as well as his own journey as a Southerner who came to reject the prejudices of his native land. 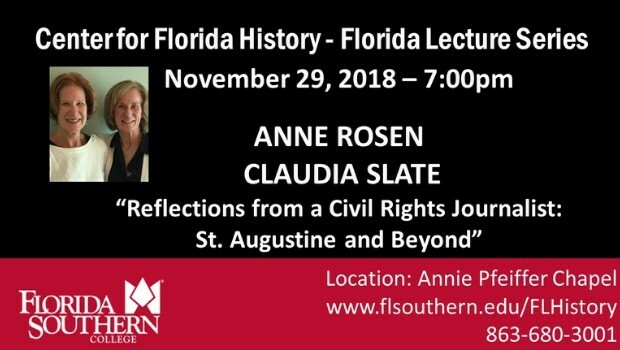 In this presentation, Anne Farris Rosen and her sister, Claudia Slate, share their memories of their father and his work. Rosen is an award-winning freelance journalist and adjunct professor at the University of Maryland’s Philip Merrill College of Journalism. Slate is professor emeritus of English at Florida Southern College. All programs are held at 7:00 PM on the Florida Southern College campus in Lakeland and are free and open to the public. The Florida Lecture Series is a forum that brings speakers to the Florida Southern College campus who explore Florida life and culture. The lecture series covers a wide range of disciplines, including history, public affairs, law, sociology, criminology, anthropology, literature, and art. The overall objective of the series is to bring members of the community, the faculty, and the student body together to interact with and learn from leading scholars in their fields. Founded in 2001, the Lawton M. Chiles, Jr., Center for Florida History strives to enhance the teaching, study, and writing of Florida history. The center seeks to preserve the state’s past through cooperative efforts with historical societies, preservation groups, museums, public programs, media, and interested persons. This unique center, housed in the Sarah D. and L. Kirk McKay, Jr., Archives Center, is a source of continuing information created to increase appreciation for Florida history.